What does one say when work asks them to travel to San Francisco for a conference? If you're me, you immediately reply, "yes!" and then text your BFF, "We're going to wine country!" And that's how I found myself relaxing on a ranch in Sonoma County. Ok, there's a little more to the story than that. Our trip fell on the worst air quality days in the Bay Area, a result of the catastrophic Camp Fire in Butte County. Thick, gray smoke blanketed San Francisco and rolled through wine country. While we still enjoyed our trip, it was a heartbreaking realization. Through the smoke, we also realized that Napa and Sonoma are some of the greatest places on Earth. From the amazing food and wine to the unparalleled hospitality, it will be your new favorite vacation destination. To plan your trip, here are lodging, winery, restaurant, and transportation recommendations and tips! Established in 1892, Beltane Ranch is a relaxation seeker's dream. Its five rooms and private cottage all feature private entries and comfy outdoor seating overlooking their vineyards and olive trees. Guests are also welcome to explore their communal outdoor lounge areas, indoor living room, and vegetable and flower gardens. Since this is a B&B, you also enjoy a delicious plated meal to prep for your long day of wine tasting! 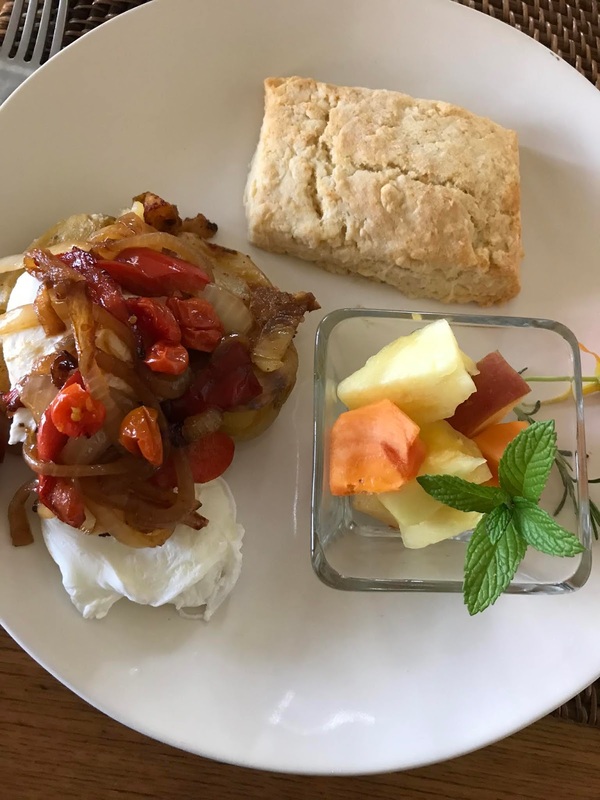 My favorite breakfast was a poached egg with sautéed peppers and onions over a smashed potato. My friend's favorite was a dish of lemon ricotta pancakes with plum sauce, scrambled eggs, and bacon. We both loved the estate-grown persimmons, too. My only wish is that I had spent more time with the resident pets: Skip, a grey tomcat, and Duke, an old black mutt. TIP: Look at a map when booking lodging! We picked somewhere easily accessible to both Napa and Sonoma. Perched in the Diamond Mountain District AVA near Calistoga, Theorem is a new winery with a few vintages under its belt. With a background in law and a love of wine, Kisha and Jason Itkin bought this Napa estate in 2012 and have since turned the 1800s historic property into a breathtaking Napa experience, blending the property's old school house charm with state-of-the-art winemaking facilities. 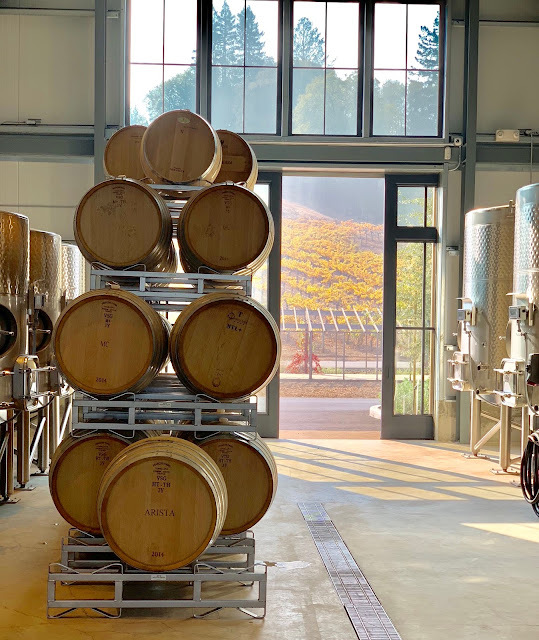 James Cerda, VP of Operations at Theorem and one of my Instagram friends (@jcerda82), gave us a tour of the freshly opened grounds and a tasting of their incredible Cabernet Sauvignon. I had high expectations considering this is one of winemaker's Thomas Rivers Brown's projects but I was not prepared for this level of concentrated, vibrant mountain fruit. 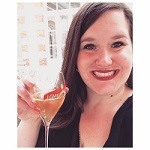 It was one of my most memorable wine experiences! Favorite wine: 2014 Voir Dire. Acidity, tannin, balance, and flavor complexity—this Cabernet Sauvignon does not miss a beat. The essence of cool mountain air lifts flavors of cherry, cranberry, black cherry, and black raspberry punctuated by notes of black pepper, violets, vanilla, and cool pine. I like it best for its brightness and red berry accents. Next stop: Rutherford! 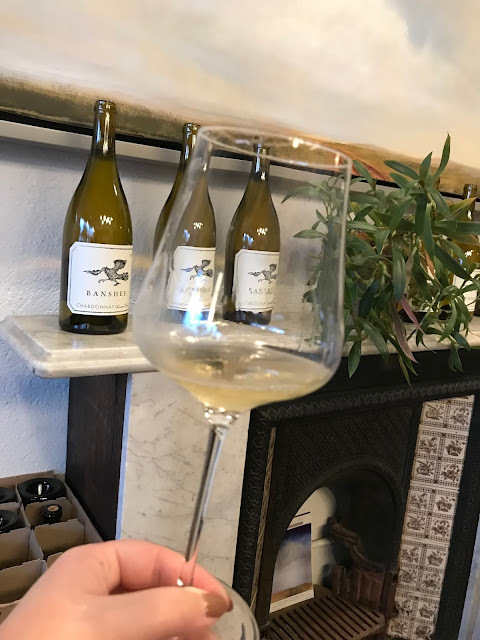 Frog's Leap is one of my favorite sustainable Napa Valley wineries making high quality wines at different price points from a range of grapes. Here we found ourselves on the back porch of our dreams! Painted slate gray, the porch is in perfect contrast to the autumn colors of the vines that surround it. 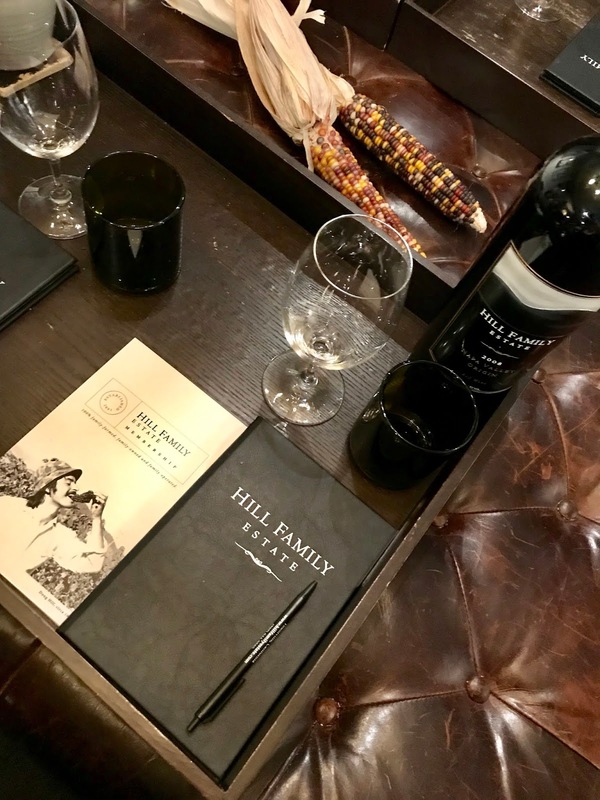 We sat at a private table for a "Signature Tasting" of four of their current releases: Chardonnay, Zinfandel, Merlot, and Cabernet Sauvignon. Our host was very knowledgable, welcoming, and relaxed. After our planned tasting, he poured us extra tastings of Chenin Blanc and Chardonnay to walk around the estate. Common theme in wine country: excellent hospitality!! Favorite wine: 2015 Merlot. I learned I have a thing for black fruit flavors with red fruit highlights! This wine is a wonderful bouquet of ripe black plums, blackberries, and red plums. It is very soft but not heavy. A truly enjoyable, well-made Merlot. 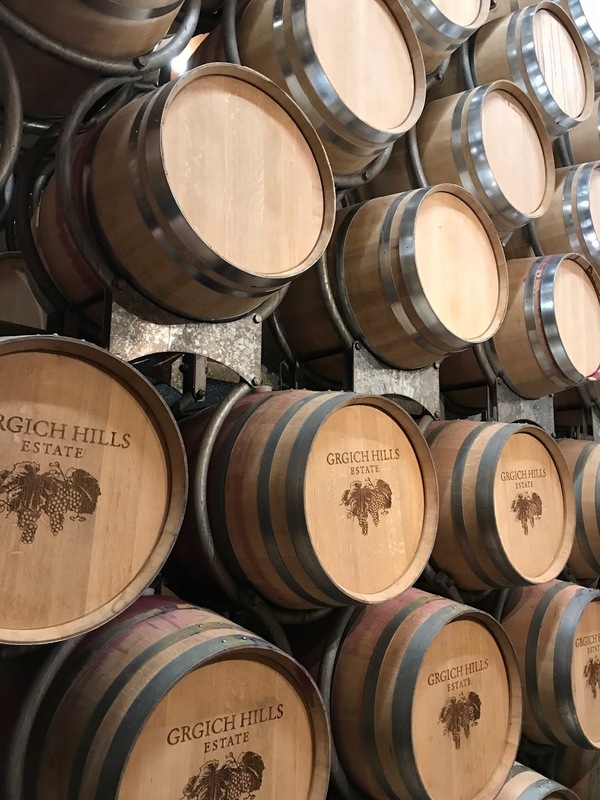 At Grgich Hills we opted for their walk-in tasting room option. I tasted through their "Intro to Grgich" option, which included Chardonnay, Fume Blanc (Sauvignon Blanc), Zinfandel, Plavic Mali, Merlot, and Cabernet Sauvignon. My friend Trish went for their white wine flight featuring an array of Chardonnay and a Fume Blanc. A huge Chardo fan, she loved this option! We both noted that it was the only winery we visited that offered an all-white tasting line-up. Something to keep in mind for you light-skinned grape fans! Favorite wine: 2014 Merlot. Grgich calls this their "cool climate Merlot" and given its high acidity, I'm convinced that's true! This wine is full of red fruits like strawberries and cranberries with pleasant savory notes. Not too velvety, this is an excellent food wine. With some time to kill before dinner, we popped into another walk-in tasting room, this time in Yountville. I walked in not expecting much and walked out with a bottle of their amazing Cabernet Sauvignon. Things worked out! Favorite wine: 2014 Atlas Peak Cabernet Sauvignon. Like the leather couch I sat on, this wine is rich and comfy. Full of blackberry, blueberry, and mocha flavors, there are also hints of dried herbs and espresso beans. This is a Cabernet lover's Cabernet. Hence why I brought one home for my sister. TIP: Vary your tasting experiences! A mix of appointments, tours, walk-ins, and tasting rooms keeps things interesting. Ridge was a dream destination for me, so we started the day there with a full tour. Since a lot of people canceled due to the smoke conditions, we ended up with a private tour with a very knowledgable tour guide! He walked us through their Lytton Springs vineyards, explained their winemaking philosophy, and even gave us a sample from one of the tanks. It was a nice touch! Ridge is well-known for "pre-industrial winemaking" as they call it. This means they use traditional techniques to create wines with more character and less chemicals. It doesn't mean they neglect science though! Since they use very little SO2, they frequently analyze wines in their in-house lab. This approach helps them catch any problems before the only solution is introducing chemicals. Favorite wine: 2015 Monte Bello. I LOVE their Lytton Springs blend but my top choice has to be Monte Bello Cabernet Sauvignon. It is known for its purity and excellence across the world. It is also far outside my usual price range at $215/bottle! And that's why I was so happy it was included in our tasting. Powerful blackberry and black plum flavors are made whole with notes of coffee, dark chocolate, and cedar. One to savor! When we first walked into Idlewild, I was like, "damn, this is cool." I am not cool, so I was a little concerned. That concern disappeared immediately when I realized the folks there were not only cool AF, they were also nice AF. Idlewild's tasting room is right on the plaza in Healdsburg. Be sure to include this hip, comfy spot if you are hopping between tasting rooms on the plaza! They make wine with Piemontese varieties like Arneis, Cortese, Dolcetto, Barbara, and Nebbiolo grown in Mendocino County. The wines are fun, but make no mistake, they are also serious! The Nebbiolo is built to last and the Cortese has shocking complexity. Favorite wine: 2016 Cortese. This partial skin ferment white is a beauty! It has so much depth and character with flavors of Mandarin orange, white tea, beeswax, and light baking spice. With its fuller body, this is my new favorite winter white wine. Seriously, I'm saving the bottle I brought back for Christmas! I'm calling it "Your Mom's Favorite" because I'm willing to bet it is! It seems funny putting a big brand after a small one but variety is the spice of life. We didn't originally plan to pop into the La Crema tasting room but I'm really happy we did. 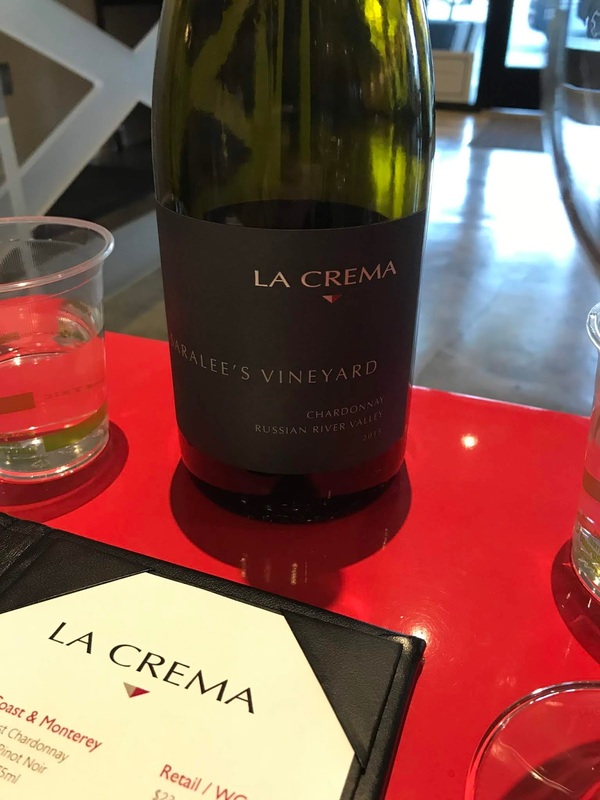 Obviously we are all pretty familiar with La Crema and their parent company Jackson Family Wines. Great value, easy to find. But I didn't know that they have a "Vineyard" selection line that is legit. We tasted some Chardonnays and Pinot Noirs from this line and left thoroughly impressed. The tasting room is on the Healdsburg plaza and worth a visit! Favorite wine: 2015 Shell Ridge Pinot Noir. This is some delicious Sonoma Coast Pinot and I am here for it. This was my favorite because of its freshness and minerality. Black cherries, layers of spice, and cool sea breeze define this powerful Pinot. TIP: Short on time? Plan an afternoon in Healdsburg where you can walk between countless tasting rooms! At Banshee I ran into my friend Kathy (@vinstagrape), which was really fun! Once I saw Kathy, I knew Banshee's Pinot Noirs must be awesome. And they were! Banshee is another super cool tasting room on the plaza in Healdsburg. 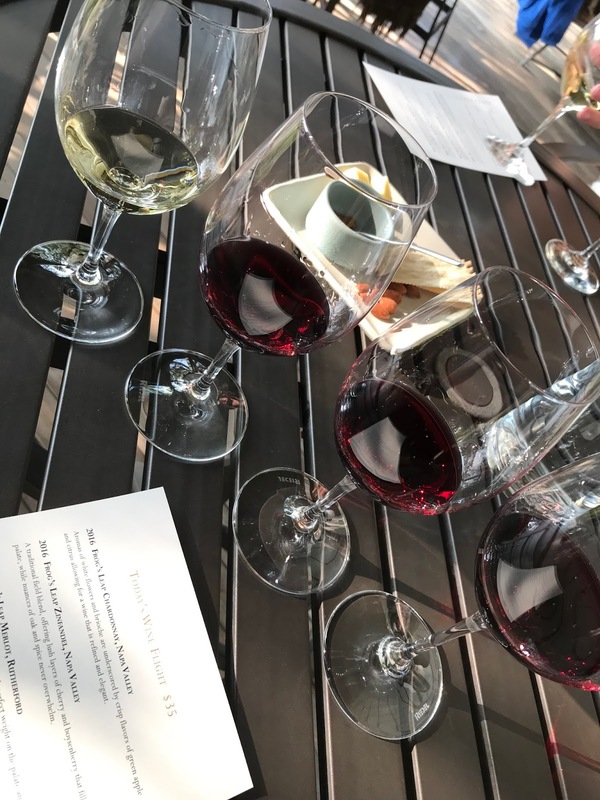 We did their "Proprietary Flight," which included one Chardonnay and four Pinot Noirs. By tasting through four Pinots from different vineyards, you can clearly see how terroir impacts the final wines. From evergreen flavors in one to five spice flavors in another, it was one of my favorite tasting flights of the weekend. 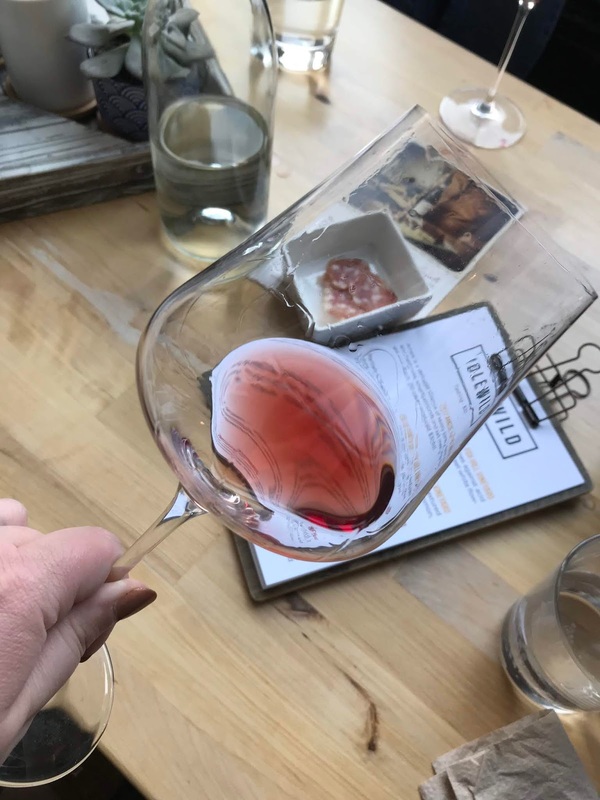 Give me all the Sonoma Coast Pinot Noir, please! Favorite wine: 2015 Clary Ranch Pinot Noir. This was the earthiest of the bunch! I love a good, earthy Pinot Noir. It had flavors of raspberry, cranberry, miso, mushroom, and wet earth. My only regret from the trip was not grabbing a bottle of this to bring home before we rushed off to dinner. Classic French-style bistro in Sonoma. We enjoyed a bottle of Idle Cellars Grenache with steak frites and seasonal risotto. Get the chocolate-covered figs for dessert!! Relaxed roadside burger joint with outdoor seating. We paired our burgers (veggie for me!) with Napa Cellars Chardonnay at the St. Helena location. Stylish pizza and pasta osteria in Yountville. I paired my four cheese pizza with Hudson's whie Aleatico from Carneros. Perfect after a day of wine tasting! Relaxed Italian cafe and pizzeria off the plaza in Healdsburg. For lunch, I had a grilled cheese with lentil soup paired with Acorn's Russian River Valley Sangiovese. Rustic yet elegant restaurant specializing in wood fired vegetables. My favorite dish of the trip was their whole roasted cauliflower in tahini sauce. For dinner, I paired their pumpkin and chanterelle pasta with Sojourn Pinot Noir. We rented a car because we also wanted to use it to tour San Francisco. The drive up to Beltane Ranch was fast and easy from SF! TIP: Give yourself a time cushion between wineries in case a tour runs over or you want to linger longer. 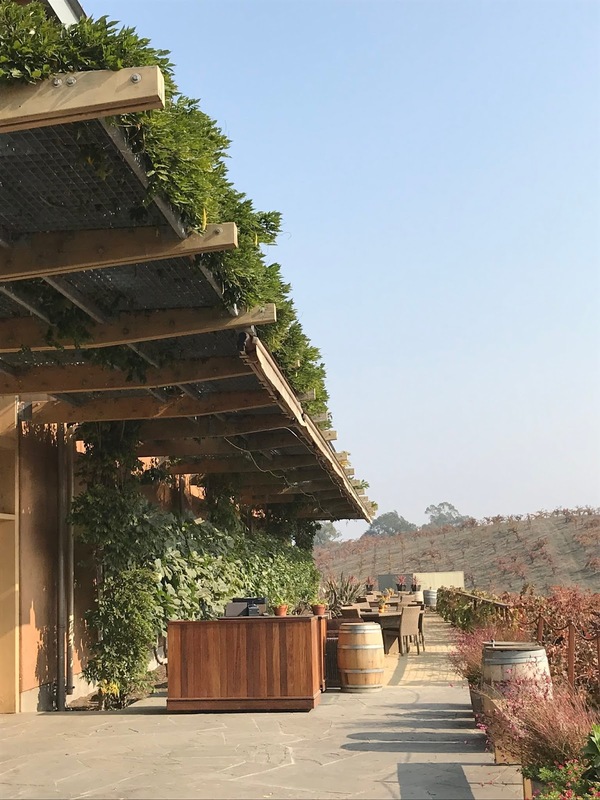 We used Uber to hop between wineries and it worked really well for us! Since some wineries are spread out, be sure to give yourself about a half hour in between locations. It took about 10 minutes to get an Uber and up to 40 minutes to travel to further wineries. Other options include hiring a driver or joining an organized tour group. The Salvation Army's Care for Camp fund provides three meals a day, snacks, drinks, essential items, and emotional and spiritual care to evacuees and first responders in and around Butte County. Donate here. I would love to do a tour next time!!! And Healdsburg is the best. So cute!